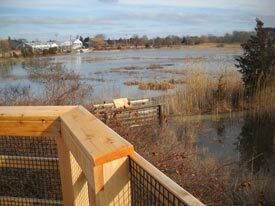 A view from the new overlook at the restored salt marsh. Eric Schwaab, assistant NOAA administrator for fisheries, joined officials from the town of Brewster, Mass., and other partners on the shores of Cape Cod?s Stony Brook to celebrate the completion of a American Reinvestment and Recovery Act project that restored natural tidal flow to 20 acres of salt marsh and opened passage for fish to nearly 400 acres of ponds for spawning. NOAA provided $1.65 million in American Recovery and Reinvestment Act funding to the town of Brewster for the project. Contractors replaced a failing undersized culvert beneath state route 6A with a much larger culvert, which allowed a more natural flow of water into and out of the marsh. ?Fishery resources on the Cape have been hit hard by habitat loss,? said Schwaab. ?The Stony Brook project helps open up passage for a historic herring run and restores important habitat for the entire ecosystem that can provide long-term benefits to commercial and recreational fisheries.? Tidal marshes are among the most productive ecosystems on Earth and directly support commercial and recreational fisheries. The new culvert has restored the natural tidal flow to the marsh and improved conditions for river herring to access their spawning ponds. The improved conditions will also decrease the amount of non-native plants on the marsh surface. ?Protecting and improving the Stony Brook watershed is one of the town?s priorities,? said Charles Sumner, Stony Brook town administrator. ?The watershed contains some of Cape Cod?s most important natural resources, including the popular Stony Brook herring run, hundreds of acres of wetlands, rare species, stream habitat, acres of protected open space, and valuable historic and cultural resources.? The new 18-foot box culvert restored tidal flow and allowed fish to migrate to their freshwater spawning grounds. The Recovery Act was signed into law by President Obama on February 17, 2009. The program was a combination of tax relief, financial assistance and infrastructure projects designed to cushion the impact of the downturn and lay a foundation for economic recovery. Over the last two years, the Recovery Act has played a significant role in the turnaround of the economy, which has now grown for six straight quarters and added 1.8 million private sector jobs over the past 13 months. NOAA received $167 million in funding for coastal restoration, and selected 50 projects nationwide. Most of the 50 projects will be completed within the next year. These projects are supporting thousands of short- and long-term jobs. When complete, these projects will have restored 8,700 acres of habitat and opened access to 700 stream miles for fish passage that had been blocked by obsolete and unsafe dams. The projects also will remove more than 850 metric tons of abandoned fishing gear and other marine trash rebuild oyster and other shellfish habitat, and protect thousands of acres to reduce threats to nearby coral reefs. NOAA?s mission is to understand and predict changes in the Earth's environment, from the depths of the ocean to the surface of the sun, and to conserve and manage our coastal and marine resources. Visit us on Facebook.